Just in case you thought we had a perfectly refined and decorated home after last week’s home tour, I am here to completely squash that idea. While I envy all the bloggers with gorgeous houses and budgets to hire professional help, that is NOT my life. So often, I find myself falling into the trap. 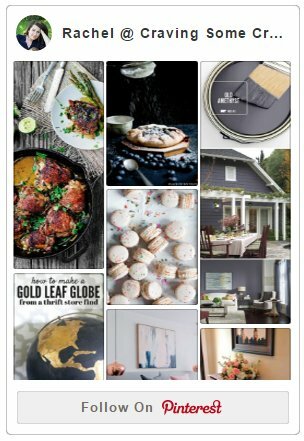 The one where I’m scrolling through hundreds of picture-perfect homes on Instagram, and I feel a little discouraged. Because we aren’t even close to “done”. Because even after so many DIY projects and weekends, I would guess the house is only about 40% finished. It’s not that I have ever been afraid to show our in-progress photos. (Hello, have you seen the house when we bought it?! We have come a looooooong way.) It’s a bit surprising to me that we still have so many plans after 4 years. But then I remember how we got here, and the accomplishments we can call our own, and all the memories. I know to count my blessings, because there are so many. So where does any of this fit in with today’s post? Today I am sharing a very proud and entirely in-the-middle-of-the-mess project. And it’s brilliant! 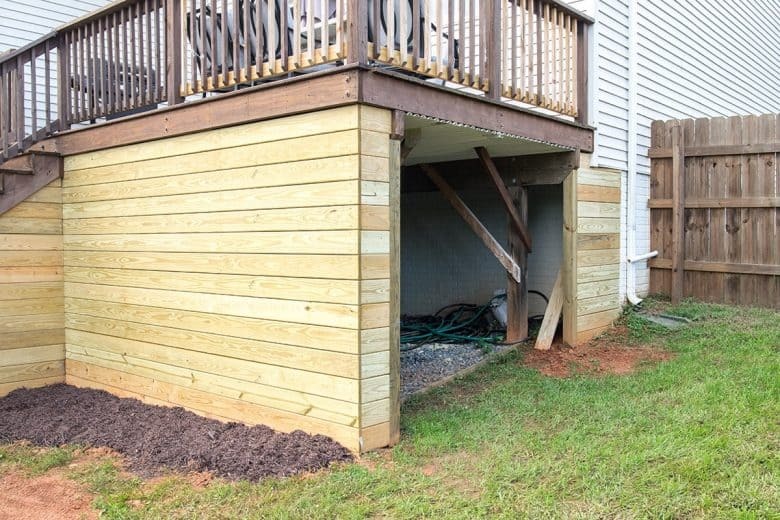 Two years ago I wrote about using underneath the deck for storage. It is too low for another seating area, and we don’t need one anyways. With only the early morning sun hitting that area, it became a giant mud hole, so we added rocks and put in a drainage system to make a storage out of it. While it was better, we didn’t like having our storage mess on general display for the walking trail behind our house. Just a little embarrassing. Now we have done one better, by turning underneath the deck into a bonafide shed! 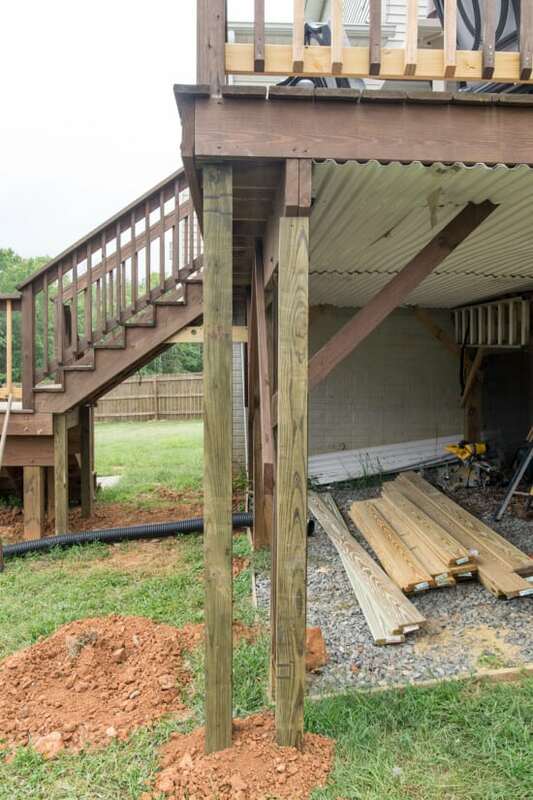 Creating an enclosure under our raised deck has been a goal for a long time, but we finally got around to it in preparation for next year’s big backyard makeover. 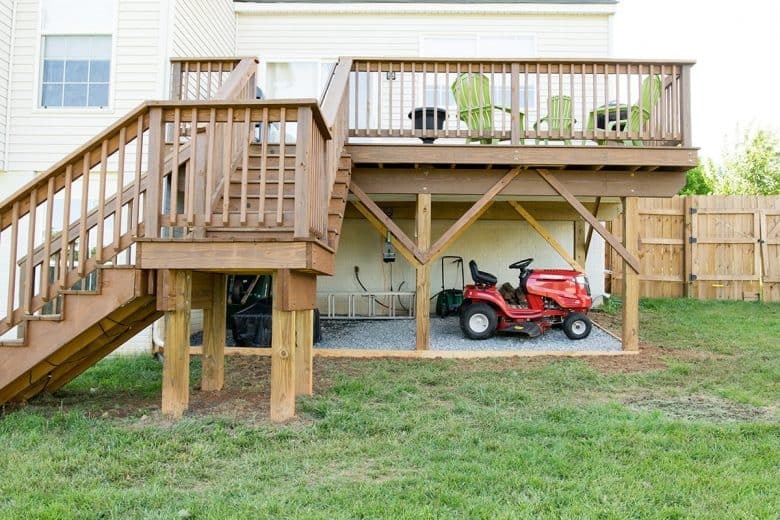 We added 4×4 posts underneath the deck, back far enough to give space to the boards. This was definitely the hardest part, because we dug the holes by hand with a post hole digger. For anyone keeping count (we were! ), that’s 15 posts. One of the hardest things we had to deal with was the giant support beams that ran end to end. On the stair platform, we cut the support beam back a bit and then added a cross support on top of the support beam. This allowed us to cover up the support beam without messing up the integrity. However, on the larger platform (above), we decided to just frame it out and leave the support beam intact, which you can see in the photo below. We are going to add another board across the top of the opening just as soon as we figure out how to keep the drainage intact when we cut it back to put the board underneath. We also wrapped all sides of the stairs and did some repairs. Because we killed most of the grass around this area with our construction, we put down mulch to cover the bare dirt and, hopefully, prevent muddy dog paws this winter. (Our dog is an inside furbaby. However, if there is any mud around, you can bet she is rolling in it!) I am already making plans for my much loved hydrangeas to go here. This is only phase one of our backyard makeover. 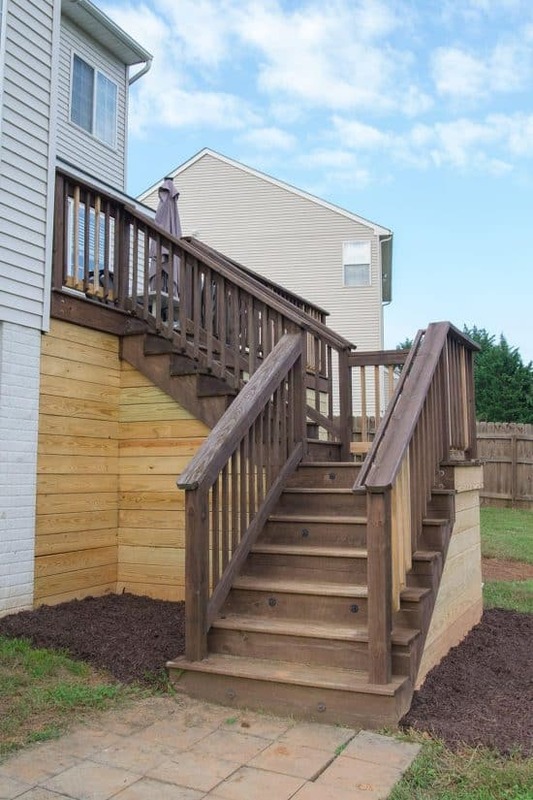 In the late Spring of 2019, we will be adding a patio and pergola to finish it out. I hope you will come back and check it out then!